Nail polish is undoubtedly something more than a makeup cosmetics… it can be stated as a girl’s first stepping stone in the amazing word of makeup and beauty items. From flirty colors to bold and subtle ones, nail polish gives you a wide galore to pick your choice in accordance to mood, style, budget and convenience. Forget about parties and outings; nail polish is our daily trend setter and mood maker to bank on. Check out some of the prominent nail polish brands available in India that promises to make your nails look attractive and addictive. Considered as the most recognized cosmetic brand in India, Lakme True Wear nail color comes in a budget friendly price to make it a delight for all. Its color lock technology ensures longevity, chip resistance and attractive stylish shades that can never fade off. You will get to find more than 30 color shades in this range of nail polish. Affordable and designed for the teenage audience better, Elle 18 is more about being trendy and funky. Flaunt your style in a chic manner with nail polishes from Elle 18 which comprise of multiple bold hued shades. Get the party grooving with this contemporary brand that basically connects with teenagers and their soaring dreams. Suited for the new generation, this range of Maybelline color show nail polish is available in some exciting and crazy color shades. Flaunt your wild self to the world in a sophisticated way with Maybelline nail polish that instantly adds oodles of attitude and attention to you. Herbal and naturally formulated without any harmful element, this nail enamel from Lotus promises excellent colors along with features such as quick drying, zero toluene and smooth application. It has a flat and sturdy brush with fine bristles for easy one stroke application. 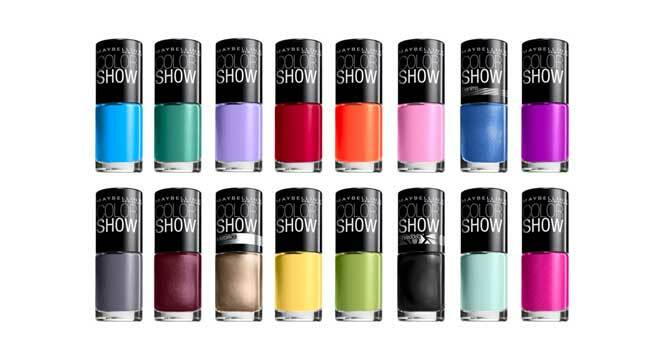 For those who love to try diverse shades of nail colors, this product from Street Wear is the right choice to opt for. Packaged in a small bottle that offers 4-5 applications, this nail color is pocket friendly and exciting. You can certainly get your choice of color from its wide palette to match your mood, dress and party in a seamless way. Finally, this nail polish does not chip off, thus making it long lasting too. Get the best of shimmer as well as matte finished nail polish with Revlon. From frosty pink to crystalline shades and glitter hues, Revlon has something for everyone. Its quick dry off feature adds to its prominence better. Pamper your nails with the amazing range of nail colors from L’Oreal Paris that are available in 26 glossy and shiny hues. It also dries quickly and provides with complete nail coverage in one stroke.